Public relations may be the least understood of all marketing tools. The basis of great PR uses media coverage, online resources, and trend setters to communicate with your audience and influence them. Our PR strategy tells your story. We build your brand, markets your events, products and services – creating a steady wave of momentum to keep your business “top of mind.” Recently in March, 2016, the Momentum Solutions Team announced a strategic alliance with Emanuela Cariolagian, known for leading her public relations agency Be in the News, Inc. 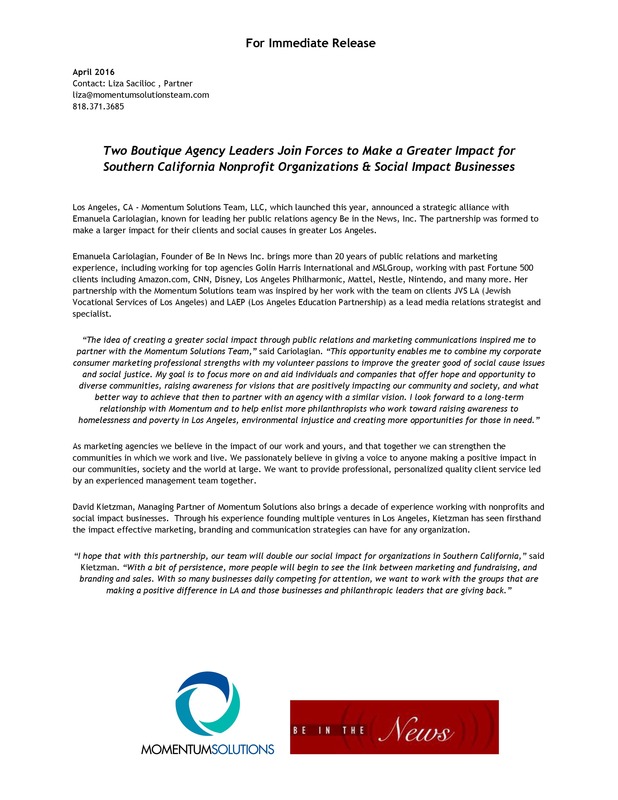 The partnership was formed to make a larger impact for their clients and social causes in greater Los Angeles.